I shared my thoughts earlier in the week about a new cookbook called Sally’s Cookie Addiction and showed you a recipe for Autumn Spice Oatmeal Cookies. 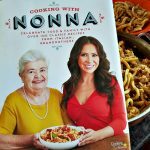 Today I’m going to offer my thoughts on another great cookbook from Quarto Cooks – Cooking with Nonna by Rossella Rago. It was sent to me at no charge for my honest review. 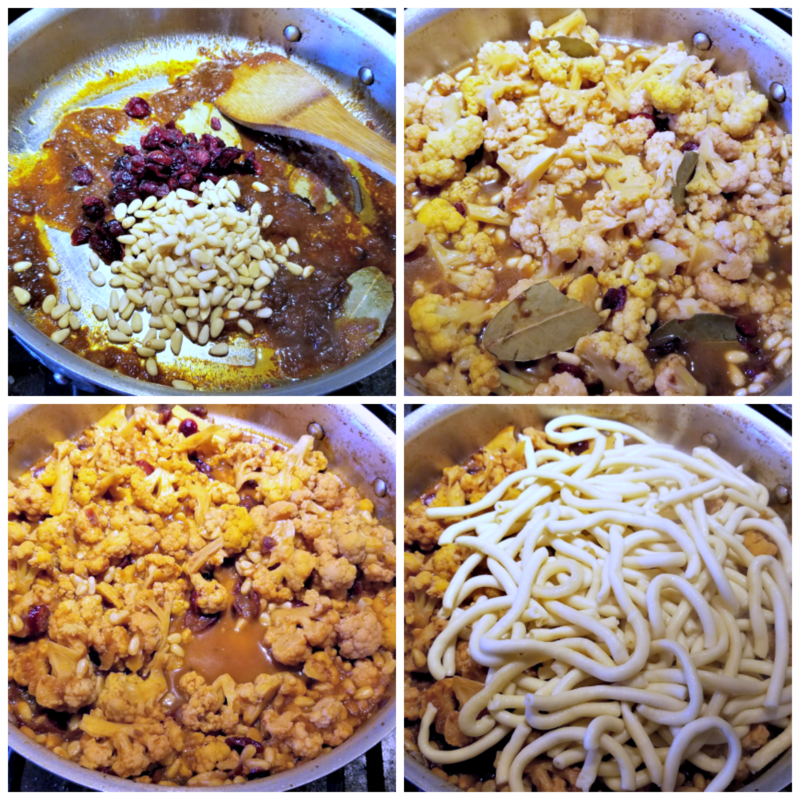 I’m also showcasing a vegetarian pasta recipe – Bucatini with Cauliflower. I was excited as it allowed me to work with a new type of pasta. I’ve never had bucatini before – neither had the hubby. Rossella Rago is the host of the popular web cooking show Cooking With Nonna. On the show, Rossella invites an Italian-American nonna to cook with her, sharing traditional Italian recipes and fond memories of childhoods in Italy. Rossella has traveled the country and performed cooking demonstrations in many cities across the United States with local nonnas as her partners. In 2010, Rossella, together with her mother and her Nonna Romana, participated in the “Italiano Battle” episode of the Food Network’s 24 Hour Restaurant Battle; Team Nonna won. Rossella spent her childhood in the kitchen with her maternal Nonna Romana, learning the long legacy of recipes from Puglia passed down through the generations for centuries. Launching Cooking with Nonna has allowed Rossella to expand her culinary expertise to much of the rest of Italy. This is a beautiful book. 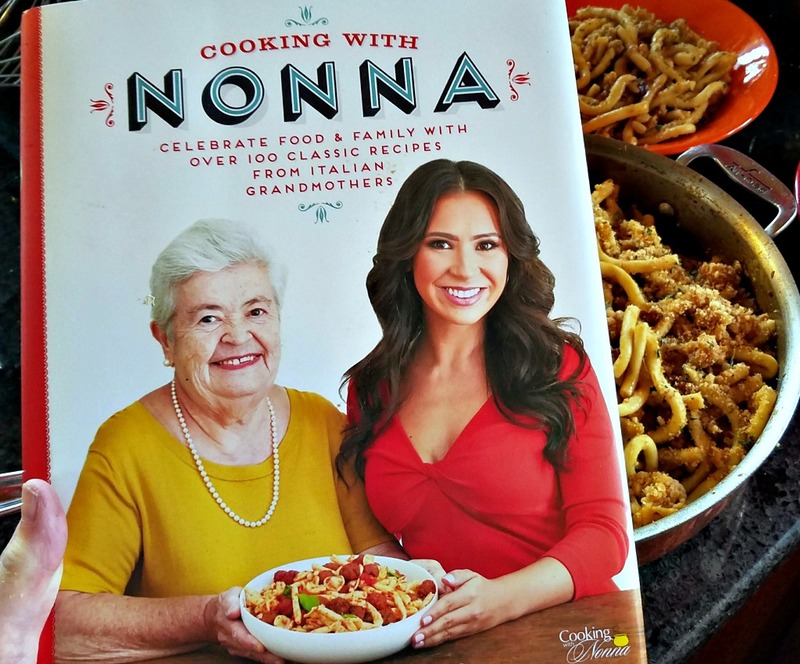 If there is one thing I love in a cookbook it’s lots of photos and Cooking with Nonna delivers. These are not fancy recipes as I am sure you can figure out by the title. These are family recipes, the type of food you get when you go for dinner at well, grandma’s house. The book is broken down into the classic divisions; appetizers, soups and salads, pasta, main dishes, meats, desserts, etc. There are over 100 recipes and they represent all traditions of Italian cooking. The recipes are easy to follow and as far as I could tell there are no complicated techniques or crazy ingredients needed to present these foods to your family. Each recipe starts with a story of its origin which makes it much more personal. I always enjoy when there is a tale behind something I am cooking. This is a happy cookbook. Add 2 TBS of the oil and the bread crumbs to a saute pan over medium heat. Cook, stirring constantly until the bread crumbs turn a golden brown. The difference between brown and burned is the blink of an eye so watch carefully. Remove the bread crumbs to a bowl and set aside. Bring a large stockpot (6 quart) of salted water to a boil. Add the cauliflower florets and cook, covered for 5 minutes. Remove the cauliflower to a bowl and keep the water to cook the pasta later. Heat 4 TBS of olive oil in a saute pan over medium heat. Add the onion and cook for 8 to 10 minutes.until the onion begins to color. Add the bay leaves, tomato paste, anchovies, raisins and pine nuts. Stir to combine. Cover the pan and let cook until the cauliflower is tender and most of the liquid is evaporated. 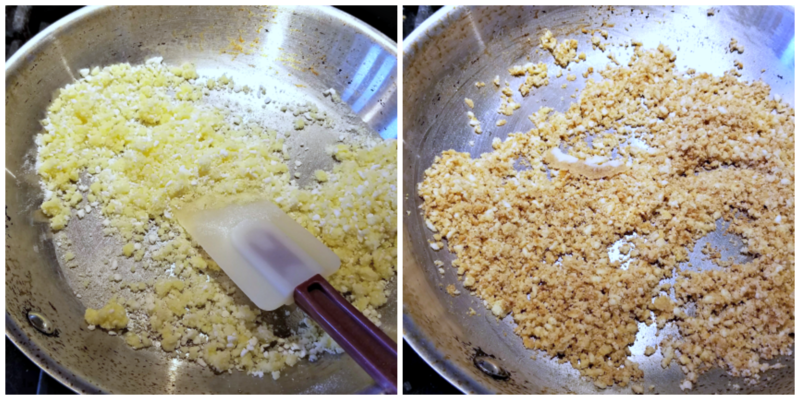 Check it now and then and if needed add a little more cauliflower liquid. Bring the water to a boil and cook the bucatini according to package directions until it is al dente. Drain and add to the pan with the cauliflower. Gently mix in. Add the remaining tablespoon of olive oil and stir. 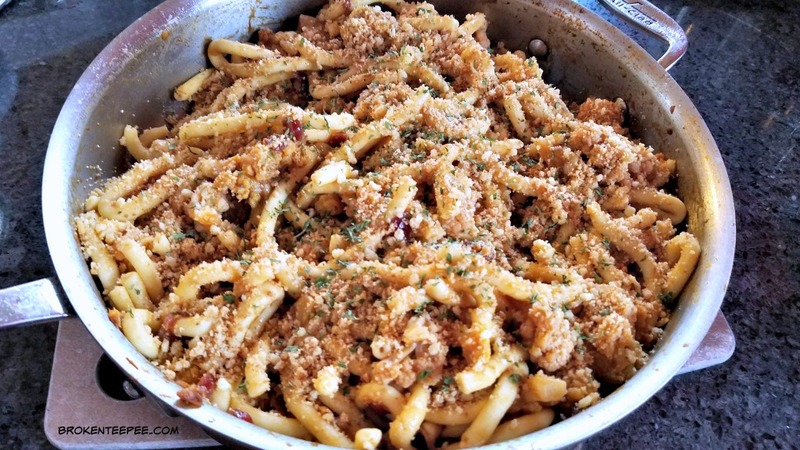 Top with the toasted bread crumbs. How was the Bucatini with Cauliflower? There were two reasons I chose to make this recipe out of all of the delicious looking recipes in this cookbook – it was one of our vegetarian nights for dinner and I had never had bucatini before. We eat meatless every other night now. My KitchenAid pasta press has 5 dies and one of them is for bucatini. 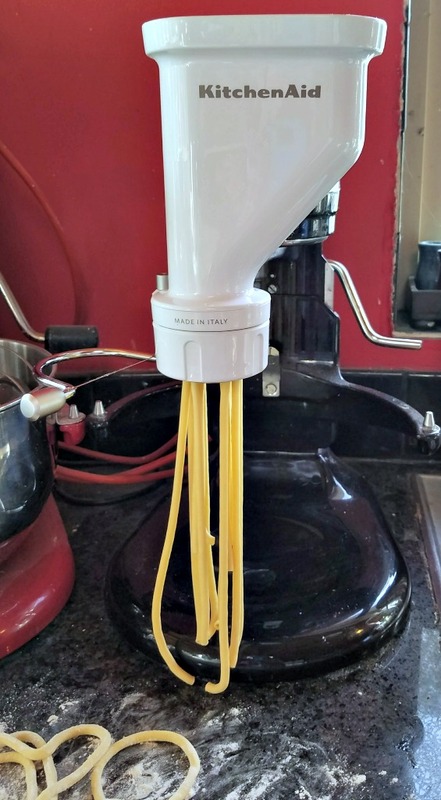 I had no idea what this pasta was so the convergence of this recipe and wanting to further experiment with my pasta press worked beautifully. This is a hearty pasta and it does take a little longer to cook than spaghetti. It is very tasty. 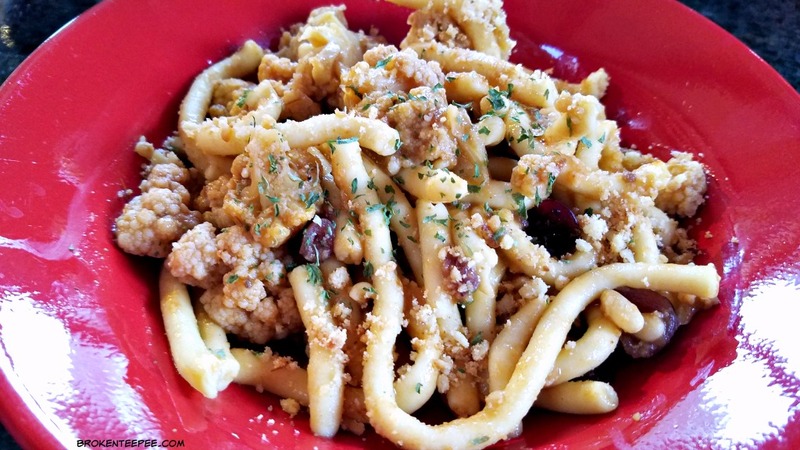 The Bucatini with Cauliflower is a wonderful winter dinner. The raisins show up as a surprise little sweet bite here and there. The pine nuts add an earthy flavor. Add 2 TBS of the oil and the bread crumbs to a saute pan over medium heat. Cook, stirring constantly until the bread crumbs turn a golden brown. The difference between brown and burned is the blink of an eye o watch carefully.